Forgive me, there is no step by step tutorial, it was nine on a Sunday night I wanted the bench ready to go by 10 AM so I worked quickly and did not stop to grab my camera. I pieced this together with a little of this and a little of that--which really is my favorite way to create. I cut the half of a door in half lengthwise and used another single panel I had from a different old door for the back of the bench. I added brackets to the inside of the bench sides for the seat. I used 3 pieces of wood from our old schoolhouse for the seat. Two of the pieces were old trim from the schoolhouse. I also added a bracket under the seat along the back, running lengthwise between the two sides. I added a board underneath the front of the seat that is a piece from an old piano we took apart. I left the finishes as they were on all the salvaged pieces. I simply did some sanding (with a respirator mask because there was probably lead paint on the old door parts) and then added a coat of Minwax Polyacrylic in a semi-gloss finish. I love the sides that are very weathered on the outside, but still have quite a bit of white paint on the inside. Four colors were revealed on the back door panel when I sanded it. Hobbled together with bits and pieces makes me happy. By the way, I scored this 100% wool, made in Peru alpaca blanket in perfect condition at the thrift store for $1.99. That makes me happy too! I appreciate the time this project must have taken. This bench is uniquely beautiful. Thank you, it came together surprisingly fast, I was in the building zone! It is unique and adorable! I love how your bench turned out, Becky...and you styled it beautifully, too! Thank you Linda. It was a quick styling s it then headed to my antique booth! The bench turned out great, Becky! I love the map pillow as well. It's a-"door"-able! You are one creative lady. Ah thank you Deb, I appreciate your sweet comments! Just a little something you whipped up...... well I love it and I pinned it. Thanks Bliss, it really did come together quickly! You did a great job on the bench Becky! I love all the projects that you do. You make them seem easy! Thank you Jan, they really are very basic construction! Thank you Laura, the pillow was a gift and I love it too! 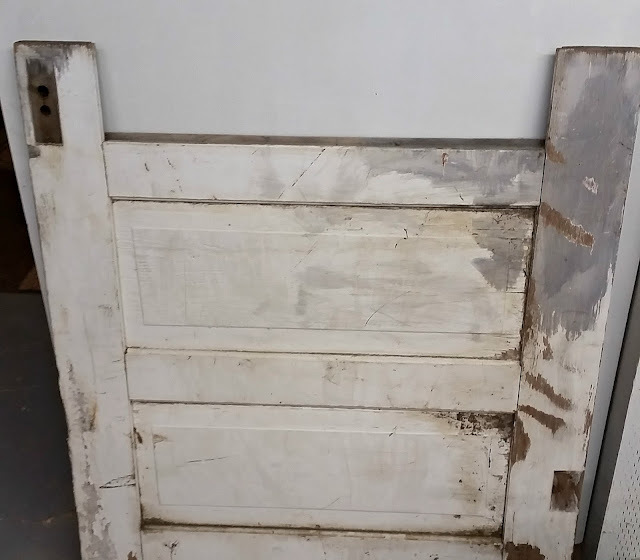 I just picked up a FREE door yesterday. I've always wanted to make another door bench. I love yours Becky! Pinned! I have a 1/2 wooden door. It's very thick and solid. Like it was a front door.did you use the half or full door?